John Thomson was a Scottish painter, mainly of landscapes. He attended Glasgow University, where he studied for the ministry to follow in the profession of his father, grandfather, and great-grandfather. He was licensed by the presbytery in 1799. When he moved, like his brothers, to Edinburgh University, he was introduced into the cultural circles of the time. In Edinburgh he met Francis Jeffrey and Walter Scott. John’s interest in painting started off as amateurish, sketching en plein air during his holidays in his hometown of Dailly; he then took this a step further and enrolled in the landscape classes led by Alexander Naysmith. In 1801 he married, but his wife died in 1809. John was left with four children. He re-married in 1813, and had four more children. While working as a minister, he never abandoned his interest in painting, with which in fact he became increasingly involved. He started selling his first landscapes. In Edinburgh he kept close contact with the intellectual circles; this is how he met Turner. In spite of his success as a painter, John was determined to keep the amateur status of the profession. He had little formal training, which certainly affected his artistic development; nevertheless he was one of the best-known Scottish painters of his time. His favourite subjects were Lowland Scotland landscapes. His connections with Sir Walter Scott also had an impact on his view of his homeland, and in turn they affected the following generations’. 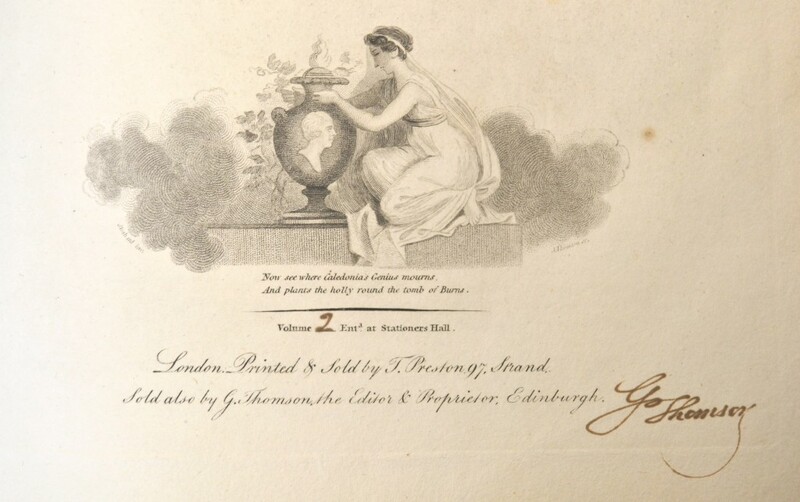 The Burns-related illustration he was involved with for George Thomson’s collection is one of the two versions of ‘Now see where Caledonia’s Genius mourns’, both designed by Thomas Stothard, but only one was sculpted by John (the other one is by Maxim Gauci). 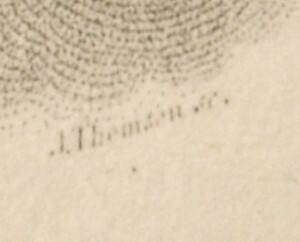 At that, John would appear to have been only involved in the early editions. 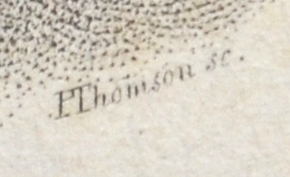 In fact, later ones substitute the “J” with a “P”, with an intermediate stage in which the “J” was corrected in certain plates to form a “P” – indicating that Paton Thomson, George’s brother, took over after a while. The illustration shows a maid with dress and hair reminiscent of ancient Greek or Roman statues; she is grieving beside an urn depicting Robert Burns’s head. The inspiration is clearly classical and meant to elevate the ‘Scottish Muse’. And plants the holly round the grave of Burns. It was included in her Poems on Various Subjects of 1803.